Off late, the one keyword in investing in the Indian markets has been Systematic Investment Plan or SIP. While I knew about it for the last few years, 2018 has been the momentous year when I have started my own SIP for perpetuity. However, I have often come across people who have probably heard the term but are just not sure of what it means and the implications of it in their financial lives. This one post intends to help you with all the details that you may need to understand about SIP and how to use it to achieve your financial goals. 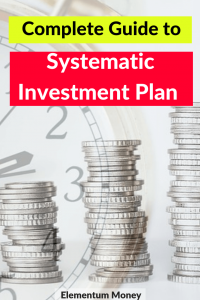 Systematic Investment Plan or SIP is not a financial product in itself. It is a form of investment into mutual funds. As a rule of thumb, you can either invest into mutual funds with one big amount as a lump sum or you can distribute it over a pre-defined frequency. When you choose to invest an equal amount into a mutual fund at a regular frequency, mostly monthly, it is called a SIP. This can be done into Equity or Debt mutual funds. For instance, I have started my SIP with a 10% debt and 90% equity allocation. Watch this space for a complete guide on Debt Mutual Funds soon. 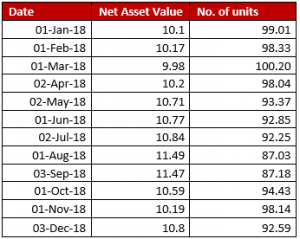 SIP works on a concept called – Rupee Cost Averaging, whereby the idea is that since you buy a particular mutual fund twelve times in one year, you will get an average purchase cost. This implies that when the market goes up, the same amount buys you fewer units of the mutual fund and when the market goes down, you get to buy more units of the same mutual fund. So, if the market goes up your money grows and if the market goes down you get to buy more mutual fund units. That’s a win-win in my book. As you can see you have ended up buying 1133.42 units at an average price of 10.59. In the long run, this averaging works out even better. The best part about SIP is psychological rather than plain numbers. How many times have you heard the advice to automate your finances? SIP is a very convenient way to put in the request and forget it at least for one year, after which you can bring it out of the closet to check for rebalancing or increasing your investment amounts. To me, the best part about SIP is that it becomes more of a habit. We finally start bifurcating the money for investing before we start spending. 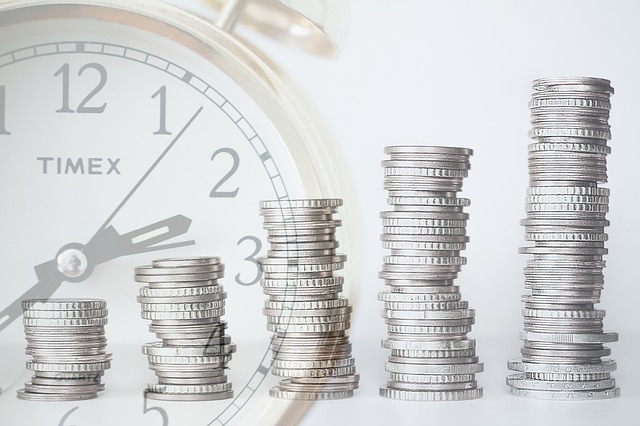 When you decide that you will save up and invest a lump sum amount, the probability of doing that is much lower than having smaller amounts automatically debited from your account and invested in a mutual fund. Have you ever seen the graph of market returns? 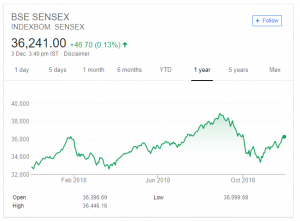 Look at how the Sensex fared in the last one year. When you track the markets obsessively, your emotions are going to follow pretty much the same trend line as that of the green line above. When it goes down, so will your emotions and the inclination to invest. When it goes up, you will also probably be exuberant and decide to invest more money. And the maxim of buying low and selling high will go out of the window. With SIP, you maintain your pace and investments irrespective of what is happening in the market. It is one step closer to making investing a little rational. When we invest such small amounts over a number of years, we barely feel the pinch. This makes it easier to do so over a longer period and invoke the god of compounding. To understand just how important compounding is and how SIP makes it easier, download this SIP Calculator and tweak it for any amount or time period. As you can see from the calculator snapshot above, just about Rs. 4500 invested every month over 10 years can balloon up to an amount of Rs. 10 Lakh. Told you, SIP is literally magical. Even with something as simple and as good for us as SIP, there are some things you can do to make it even better. While investing in direct stocks is good and can help in wealth creation, it requires far more time and understanding of underlying fundamentals. I firmly believe that regular investments in Mutual Funds through SIP is really the way to making investing a long-lasting habit. As a start ensure you allocate at least 10% of your net income to SIP. Use the rest of your salary for your fixed obligations like Rent, EMI etc, while using any remaining amount for discretionary spends or any other risky investments. This has to be one of the most important things you could do in your investing journey – do not put a break in between your SIP. However low the market may go or the heights it may go to, do not stop the SIP unless your financial goal is approaching closer and the right allocation demands the funds to be shifted. There are two problems with putting a break in a SIP. One, no one can predict when the market will really gain and you may lose out on the really important days. Two, humans are creatures of habit. Once you become habituated to having the extra liquidity from not investing in SIP, there is a high probability that you may not go back to that habit again. Most of the projections in any financial goal planning have an Achilles Heel – the calculations mostly keep the monthly input amount constant with no changes over the years. Look at stepping up your SIP amount every year in tune to increments in your salary. Not only will you avoid lifestyle inflation but you end up putting in far more money to be grown efficiently towards fulfilling your financial goals. Take your first step today. Even as you google, there will be enough results to help you smoothly open a SIP account almost instantly. Do you have a SIP? Have you fulfilled any financial goal thanks to a SIP? Let me know your thoughts in the comments.